* In the autumn of 2009 started a new satellite tracking project between the Finnish Musem of Natural History, the Finnish Osprey Foundation and UPM. The project monitors the life of a male osprey "Jukka" with a GPS-Argos satellite transmitter. The scientific supervisor of the project is professor Pertti Saurola. * Jukka was equipped with the satellite transmitter in July 2009. * Jukka started his autumn migration on 24th September 2009 and 4th November 2009 Jukka has reached his wintering location at the Lagdo reservoir. 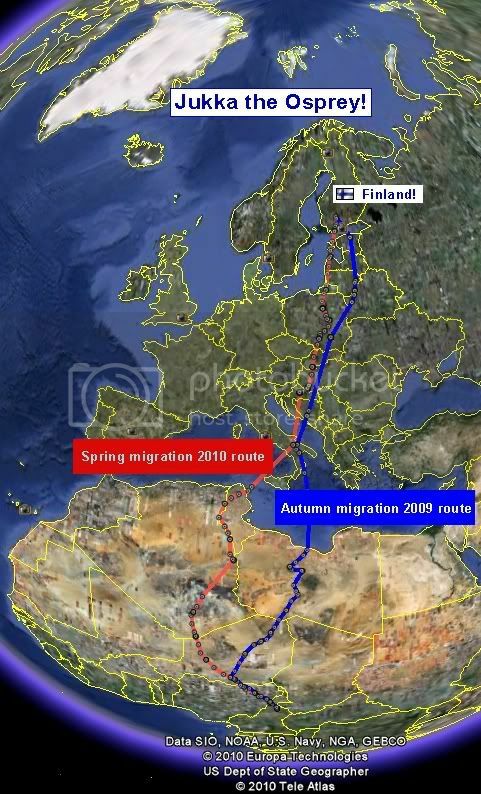 * Jukka's spring migration 2010 has not started yet. Super Ploughboy, I have tears after watching the Born to Travel video. Good Spring Migration to Jukka Osprey! Wellcome back! ....and that video...definitely a must see for everyone...birds are such amazing creatures~so delicate, yet full of strength and courage!!! I agree . . . that video, "Born to Travel," is a "must see" for everyone here. Simply wonderful! 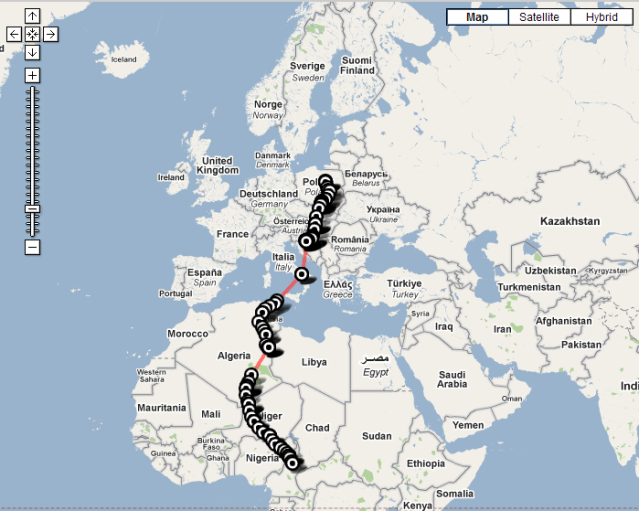 * Jukka's spring migration 2010 has started! "At this point, Jukka has over 900 km as the bird flies to go to his nest at Pälkäne. It has reportedly been much damaged during the winter. With his current speed, Jukka has four or five days yet to go." 14th April 2010 (late afternoon) Jukka the Osprey reached the Finnish border and 20 hours later he arrived on his nesting area . During the spring migration Jukka flew over 6800 km, average 280 km per day. Let's hope that Jukka gets now some fish - though there are still ice on lakes. Thanks Ploughboy . . . that's great news about Jukka finally being home to his nesting area! That's quite some trip he makes twice a year! Thanks for keeping us posted on his long journey. PLOUGHBOY, thanks for bring us the wonderful news!!! Do we need to worry about Jukka fishing? Are there rivers with running water near by that he can fish?